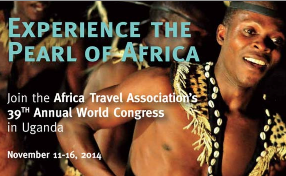 IIPT resumes its fifteen year relationship with the Africa Travel Association (ATA) by partnering in its 39th World Congress, being held in Uganda, November 11-16, 2014. ATA�s signature event will address timely industry topics, offering a line-up of educational and professional development opportunities and showcasing Uganda�s newest products and services. Delegates will also have the opportunity to participate in ATA�s Young Professionals Program forum, a tourism ministers� roundtable, business-to-business and networking events, an African Bazaar, host country day(s), gala dinners and pre- and post- country tours. 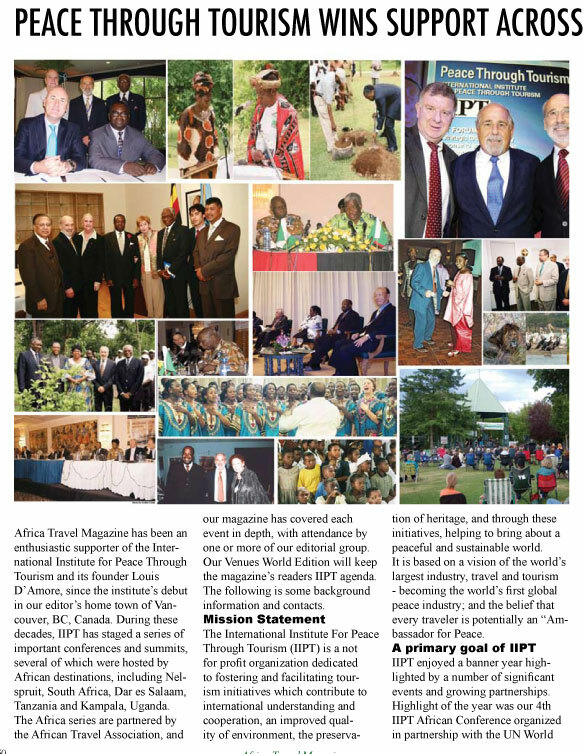 IIPT is also proud to have ATA as a partner in the IIPT World Symposium: Cultivating Sustainable and Peaceful Communities and Nations through Tourism, Culture and Sports to be held in South Africa, February 16-20, 2015. 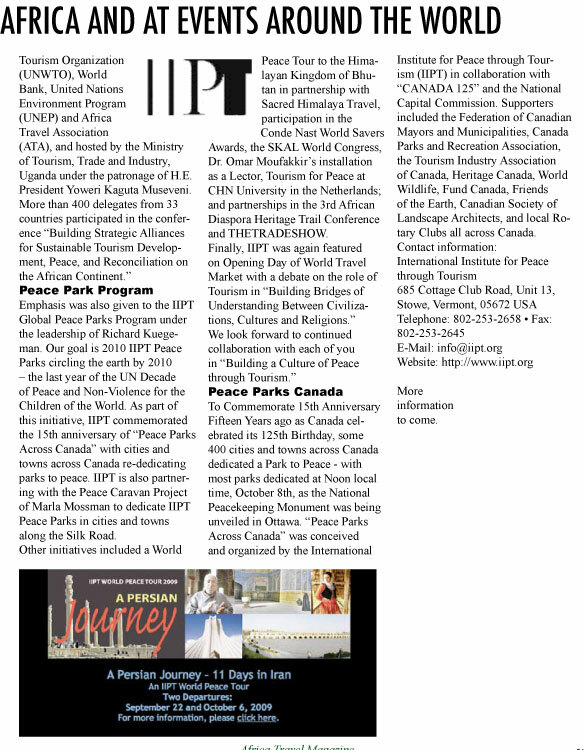 IIPT World Symposium to honor the legacies of Nelson Mandela, Mahatma Gandhi and Martin Luther King, Jr. The International Institute for Peace through Tourism�s next event will be a World Symposium honoring the legacies of the world�s three champions of Non-Violent Resistance: Nelson Mandela, Mahatma Gandhi and Martin Luther King, Jr.
To be held at Emperors Palace, nearby O.R. Tambo International Airport, Metropolitan Municipality of Ekurhuleni, Gauteng Province, South Africa. The Symposium, which has been endorsed by Archbishop Desmond Tutu, will have two basic aims: to identify strategies and best practice in cultivating productive, sustainable, peaceful and welcoming communities through tourism, culture and sports; and to identify the potential roles of tourism, culture and sports in reconciliation and socio-economic re-development of countries that have experienced conflict with a view towards building sustainable and peaceful nations. Design of the Symposium will be highly interactive with international experts in community development, community tourism, sports, culture and peace engaging with delegates in the exchange of experiences and ideas; and Ministers of Tourism from countries that have experienced conflict sharing their insights and suggestions related to strategies and best practices for reconciliation, healing wounds of conflict and harnessing tourism, culture and sports in the re-development process. In addition to Ministers of Tourism from Africa, selected Ministers from countries of Europe, Asia and South America that have experienced conflict will also be invited to participate in inter-active plenary session panels. As with past IIPT Conferences and Summits, Pre-Symposium events will include a full day Educators Forum and full day Student/Youth Leadership Forum. As well, following the precedent of IIPT�s Fifth African Conference in Lusaka, Zambia, a full day Traditional Leaders Forum is also planned. As well, a US $2,500 scholarship award will be presented to the inter-disciplinary team of 3-5 students writing the best paper on the Symposium Theme of Building Sustainable and Peaceful Communities and Nations through Tourism, Culture and Sport.